Maria betters the lives of her clients every day with her beautiful and natural wig creations! Her NATULIQUE-coloured wigs help to build up her clients’ self-esteem and identity of self and give them the confidence they need to enter new chapters in their lives. 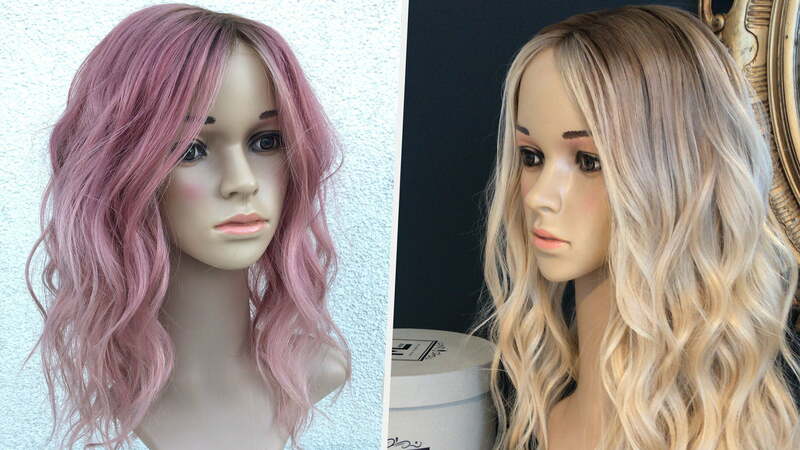 How did you, as a hairdresser, get involved in making wigs? I used to work in “regular” salons, and I have always been interested in hair and skin, and how the condition of it affects us, our self-esteem and health. With this passion, I began to study hair and skin diseases, and later I was employed in a wig shop. But despite learning a lot, the place was quite old-fashioned and I never felt that I could do enough for the clients. Therefore, after working with wigs for 9 years, I started to build my own wig salon, and today I have been a proud salon owner for 1 year. My greatest motivation is definitely the feeling of helping or solving a problem for my client. Many of my clients have had the terrible luck of getting diseases that make them lose their hair, and by creating beautiful and natural-looking wigs, I feel that I can take away some of their concerns and worries. Additionally, I really want to remove and break away from all the prejudices about wigs. If they are done the right way with great expertise and passion they look just like real hair. Could you please elaborate on the creation process? For starters, I always book 45-60 minutes of free consultation with a new client, and they are always free to bring support in form of a friend, spouse etc. – whatever makes them the most comfortable and secure! I make sure to write everything down that we talk about and let the clients try on different wig styles, to provide the best possible customer service. During the consultation, we discuss the look of the wig both inside and out including the size, density of the hair, length and colour. Then, I provide the wig factory, with the information they need for the production phase. All wigs are made of 100% human hair. Once I receive the wigs, I can begin the creative colouring process with NATULIQUE. For my clients, the colour is the most important thing, even if it is just small and subtle highlights. I love working with non-toxic products and being able to provide my clients with the absolute best care. I always encourage the customer to come back for free of charge adjustments and cutting when they have tried the wig for a while – small details make big differences! Why do your clients come to you, and which challenges do they have? Most of my clients have Alopecia and have lost all of their hair or half of it. With Alopecia Areata, it’s the hair follicles that are attacked. This causes the hair to come out, often in clumps the size and shape of a quarter. Alopecia can come in different stages, sometimes the hair grows back and sometimes it never does. Some of my clients have been with me for over 10 years. Additionally, many of my clients are going through chemo and want a wig during the difficult transition time from having a head full of hair to nothing. Thankfully treatments are very good and many recovers and get their natural hair back again. I also meet clients that have gone through surgery and have scares that need to be covered or hereditary hair loss. Hair is a sensitive topic for many, so many of my clients have difficulties trusting that I will help them the best possible way I can. I know that it is a lot to ask, the shock and the pain to lose your hair is terrible. I get impressed all the time of my clients because they are so strong and open about their situations. I often meet “former” clients who have gone through chemo and come back for a haircut or hair colouring when their own hair starts to grow back – what an amazing feeling! And the best part is being able to give them a healthy treatment using non-toxic products! How does your work impact your clients? When my clients wear wigs that make them feel like their true selves, I sense a strong form of relief! I can tell that they feel so much better and that it is more easy for them to go out and be social, and to maybe even meet new people. When I started my company, I wanted to provide and care for my client’s needs which to this day is still my biggest motivation. I don’t want my clients to choose from a couple of wigs in boxes, I want the feeling to be as if you go to a regular hair salon with your own hair. I feel that I have to compensate my client’s loss with a really really good wig, and that’s what keeps me passionate – to me, I have the best job in the world! Want to see more of Maria’s inspiring work? Follow her on Instagram or check out her website. If your salon wants to be a part of wig creations, you can do so by donating hair! Find out more in our blog about hair donations. #realtalk: Cosmetic Animal Testing Needs to End! World Water Day: How does water quality affect your hair? Is Ammonia Free Hair Color Healthier For Your Hair?